At the age of 17, Kerissa Nelson, Grantsburg, won the National Jr. Duck Stamp Contest with her painting of a pair of ringnecked ducks. During her sophomore year of high school, her art teacher saw her painting of a rose-breasted grosbeak and recognizing her talent, encouraged Kerissa to enter the Junior Duck Stamp Contest. The following year, as a junior, she painted a pair of green-winged teals and earned first place in her age category for Wisconsin, just short of the Best of Show title. 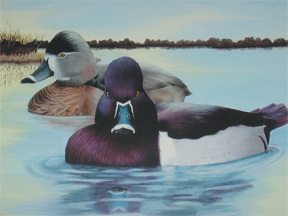 is featured on the 13th Junior Duck Stamp. Her painting is still available as a limited edition print. The Junior Duck Stamp is a pictorial stamp produced by the U.S. Fish and Wildlife Service and sold by the U.S. Postal Service and Amplex Corporation. All proceeds from the stamp sales are used to fund environmental education programs and scholarships.